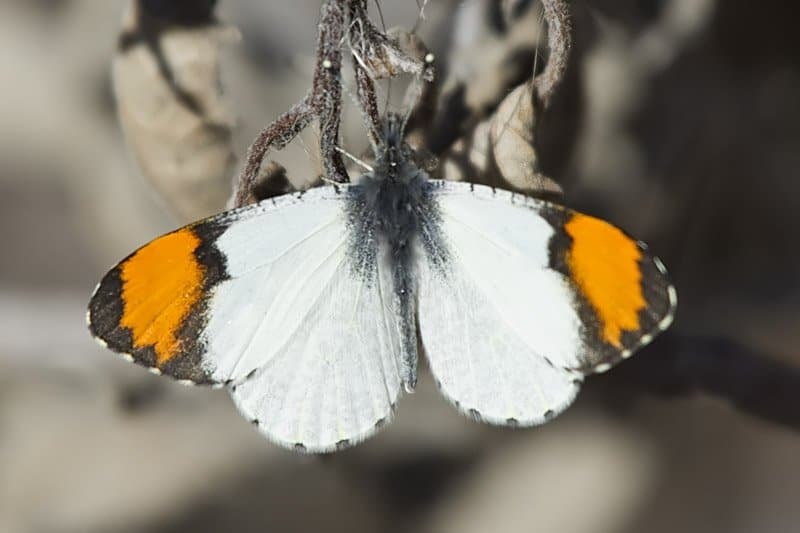 I am always pleased to see my first Sara Orangetip of the year as it signals the arrival of spring and the beginning of a new butterfly season. They are best observed patrolling canyon slopes, creek beds and washes. They stop at flowers but usually only briefly. The remind me of the touch and go landings I have seen from military aircraft. It took me many tries before I captured my first image of one of these in Sabino Canyon. Sara Orangetips are quite distinctive. 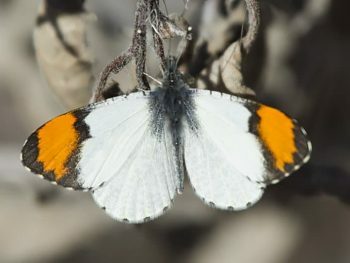 They are a small 1½-inch white butterflies with bright orange wing tips. The males flit along trails in search of females starting in February and continuing into April. The females search for native mustard host plants, especially rock cress, on which to lay their eggs. 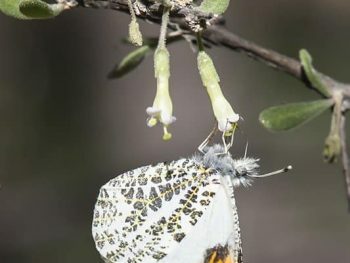 These images of male Sara Orangetips were all captured by the author in Sabino Canyon during the months of February and March of the last few years. The females have less orange and there is some white between the black edge and the orange. Some of the females occasionally are creamy-yellow instead of the pure white of the males. 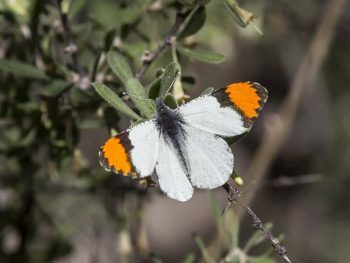 There is another similar butterfly, Desert Orangetip, which occurs in Sabino Canyon during some years. 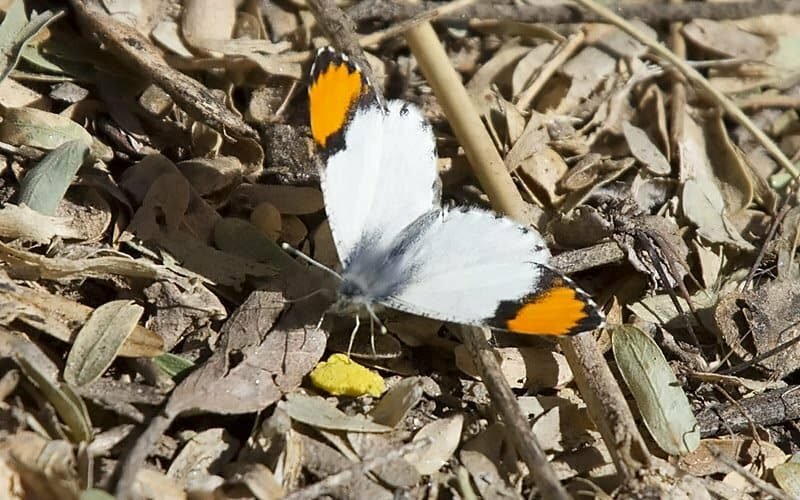 The Desert Orangetip has a little less orange (not the greatest field mark as it somewhat relative) and the pale edge of the wing is fairly wide. Both of these field marks are not easy to see in this small fluttering creature. 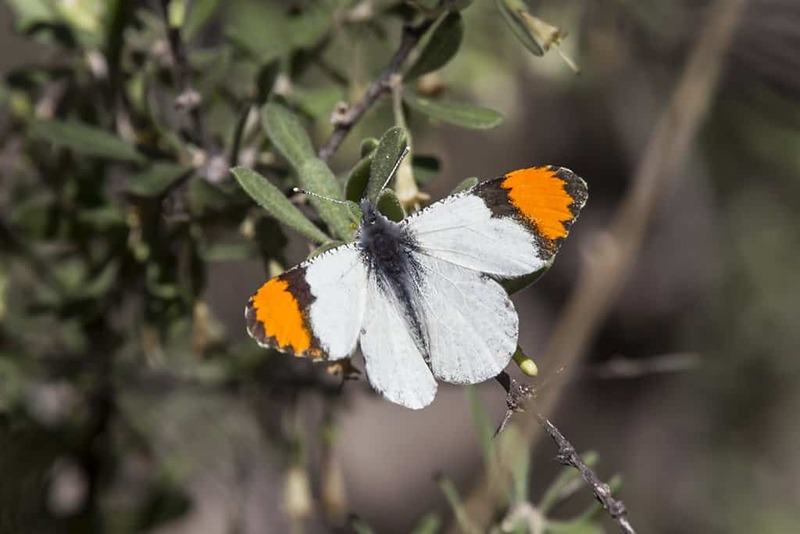 Luckily however, in Sabino Canyon the Desert Orangetips are all the Pima subspecies which is fairly bright yellow on most of the wing (as opposed to the creamy-yellow of some Sara females). 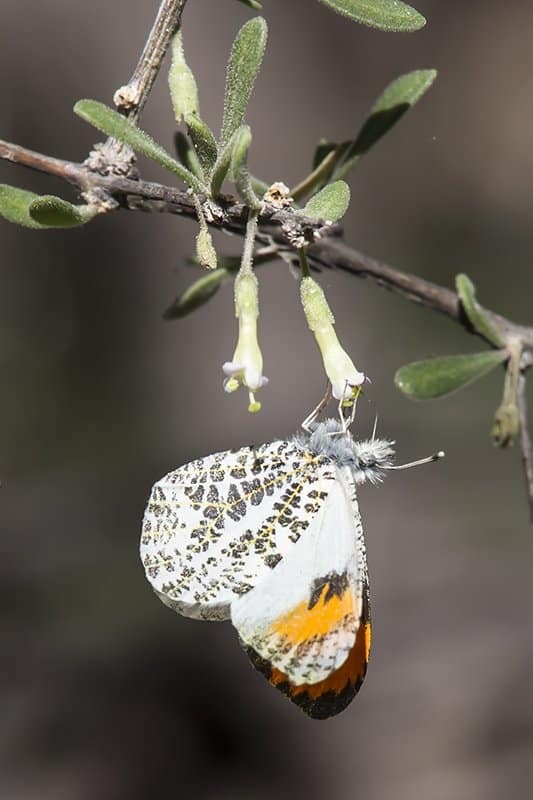 Because Desert Orangetips are usually uncommon in the landscape compared to the Sara, they use a different strategy to find mates. They are hilltoppers. Males will stake out a small territory on a high point chasing each other around. The females know to go up to these hilltops to mate. This is kind of like a singles bar for butterflies. Note one of the best Sabino hilltops is the one where the old stone water tank is, just to the south of the high point of Deadman’s Hill along the main tram road. Many other hilltopping butterflies species can be found there including Pipevine Swallowtails, Spring Azure, Great Purple Hairstreaks, Bordered Patches Painted Ladies, and Red Admirals.